Shared Blog Post – Food Transitioning versus Food Rotating: What is the Difference? I recently saw a meme posted on Facebook with the words “Getting a dog without understanding the breed is like buying a house without an inspection.” A discussion followed as to whether or not this was a good way to emphasize that breed matters when you are selecting a dog that will best fit into your family, lifestyle, and the environment in which you and your dog will live. I agree with the sentiment of the text in this meme; however, I believe that the question of how important breed is when selecting a dog is far too important to leave to a discussion on Facebook. If you want the greatest probability of getting a great canine companion, you need to consider breed before purchasing or adopting a dog, and your research needs to extend beyond social media and avid fans of the breed. Every breed or mix of breeds has its downside, not often apparent to their biggest fans. The American Kennel Club (AKC) currently recognizes 202 different breeds of dogs organized into seven groups: Herding, Hound, Non-Sporting, Sporting, Terrier, Toy, and Working. 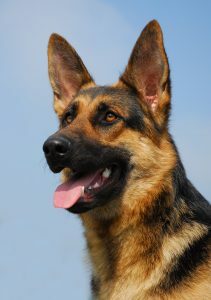 Different breeds of dogs exist because each breed was developed to address a particular need or role in serving humans. In some cases, the AKC group description is helpful in understanding what a dog was bred to do, while some of the groups contain breeds with a wide variety of individual physical and behavioral traits and I question how they were lumped into the same group. However, looking at the Group is a good place to start. Below you will find my thoughts on each AKC group and factors that I recommend you consider before deciding which breed is the best for you. Please recognize that you want to choose a breed that is also the best choice for your family, your lifestyle, and the environment in which you live. The average lifespan of a dog, which can also be breed dependent, can range from six to eighteen plus years. As you consider your current lifestyle and environment, think about the future and what your life will be like when your dog is older. Adding children to your life or moving from a rural to an urban environment should be considered when you choose your breed. The most popular of the breeds in the Herding group is the German Shepherd Dog, which has been second on the AKC’s list of Most Popular Dog Breeds for the past four years2. Other dogs in this group include Australian Shepherds (#16), Corgis (#18, #69), Shetland Sheepdogs (#24), Collies (#37), Border Collies (#38), and more. I describe many dogs in the herding group as “Those with a passion for bringing order out of chaos.” Often the dogs in this group need to herd and will attempt to round-up everything from your livestock, to ducks at the park, your cats, other dogs, the neighbor’s children, and yes, even stationary tennis balls. Some breeds herd with their eyes while others use quick, but effective and often uncomfortable nips with their teeth. If you live in a chaotic household and have children nearby, you should carefully consider if a dog from the herding group is a good choice for your situation. On a positive note, the dogs in the herding group have been bred to work in close collaboration with a person so they can be easier to train. 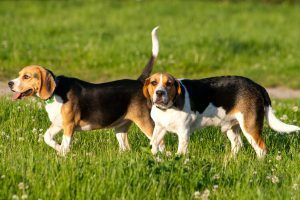 The favorite breed in the Hound group is the Beagle, which has been the fifth most popular dog in the USA since 20152. Other dogs in the Hound group include Dachshunds (#13), Bassett Hounds (#39), Bloodhounds (#52), Greyhounds (#151), and more. The key thing to remember about the AKC’s comments on the Hound group is that hounds were bred to hunt by selectively breeding them to emphasize their predatory instincts. Some hounds use their sight, and some use their impressive sense of smell, but they are both experts at detecting and chasing down prey. 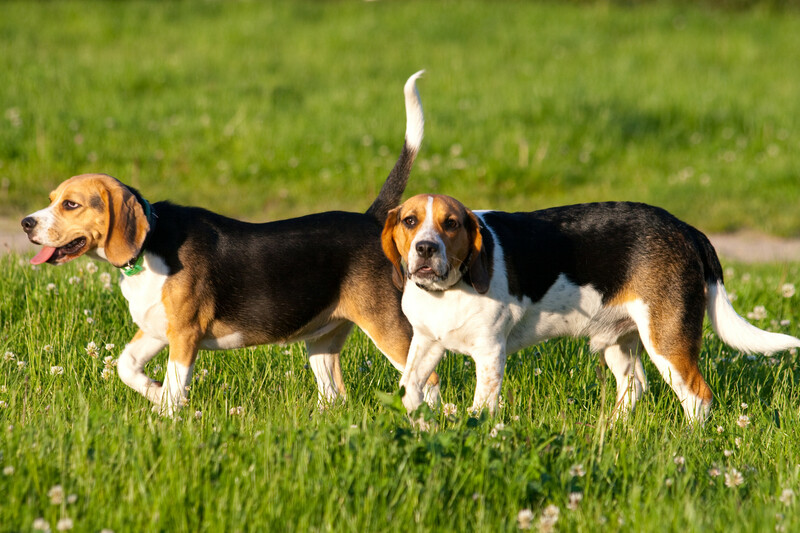 Since hounds often work independently of their handler, unlike the breeds in the Herding and Sporting group, a hound may be more challenging to train. While it is not impossible to train a hound to be off-leash in unfenced areas, it will typically take more time and higher value rewards. Some hounds will never reach off-leash reliability no matter how skilled you are at training. Because many of the hound breeds have been bred to work as a group, they can have excellent social skills and will often do well with other dogs. Many dogs in shelters are labeled as being part hound, and we see a wide variety of them for both boarding and daycare. If you put the time and effort into training your hound and have reasonable expectations, they can make excellent, laid back companions. Yes, I said laid back. I cannot think of any hound I have met that I would classify as hyper. Some would argue that future behavior is all about the environment and the way a dog is raised. 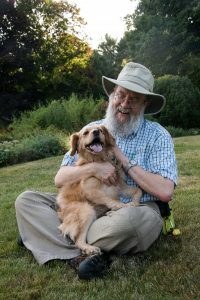 Environment certainly plays a tremendous role in a dog’s temperament but so do genetics, and we cannot change genetics. If you want the best possible companion that meets your criteria of “the perfect dog,” then spend some time researching the breeds before you get your dog. Last month I started a three-part series on the importance of understanding your dog’s breed and what they were bred to do before selecting a dog. That understanding is critical to making sure you get the perfect dog that we all seek. Last month I discussed the AKC Herding and Hound groups. This month I will look at the Non-Sporting, Sporting, Terrier, and Toy groups. Some of the more popular breeds in the Non-Sporting group include Bulldogs (#4), French Bulldogs (#6), Poodles (#15), the Bichon Frise (#45), Dalmatian (#62), Keeshond (#92), and more2. The breeds in the Non-Sporting group are so diverse that discussing them as a group is not very valuable. For that reason, I recommend that anyone considering a dog from this group not only talk to breeders but also veterinarians, trainers, and kennel and daycare owners about your particular breed of interest. Always make sure you seek advice from those with no financial gain in the breed that you choose. The Labrador Retriever has been the most popular dog in the US for many years, and the Golden Retriever often holds the number three spot on the AKC most popular breeds list2. Other popular breeds in the Sporting group include; German Short-Haired Pointers (#11), Brittany’s (#25), English Springer Spaniels (#26), Cocker Spaniels (#29), and more. 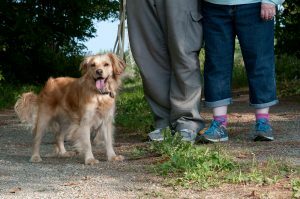 We see lots of Sporting breeds in Maine due to their overall popularity but also probably because many Mainers love outdoor adventures and so do the dogs in the Sporting group. These dogs are bred to work closely with their handler, so they often are some of the easiest dogs to train. However, they do tend to be some of the larger breeds as well as being well known for their enthusiastic exuberance. If you have a dog from the Sporting group, starting training at an early age is essential. Because of their retrieving instincts, some of the Sporting breeds can be overly mouthy, so training them appropriate bite inhibition before they are 13 weeks of age is critical. For hundreds of years, retrievers have been bred to have the stamina and instincts to hunt during hunting season while being able to relax and be an ideal companion dog the rest of the year. Within the past few years, some of these dogs have been bred to be, in my opinion, overly driven so as to be more competitive in field trials. 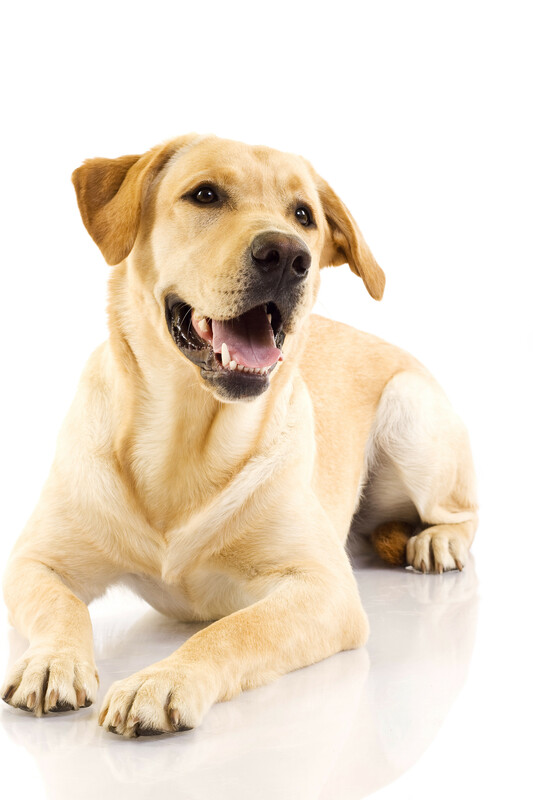 These dogs are not always a good choice as a companion as they often exhibit poor bite inhibition and a hyperactive personality. 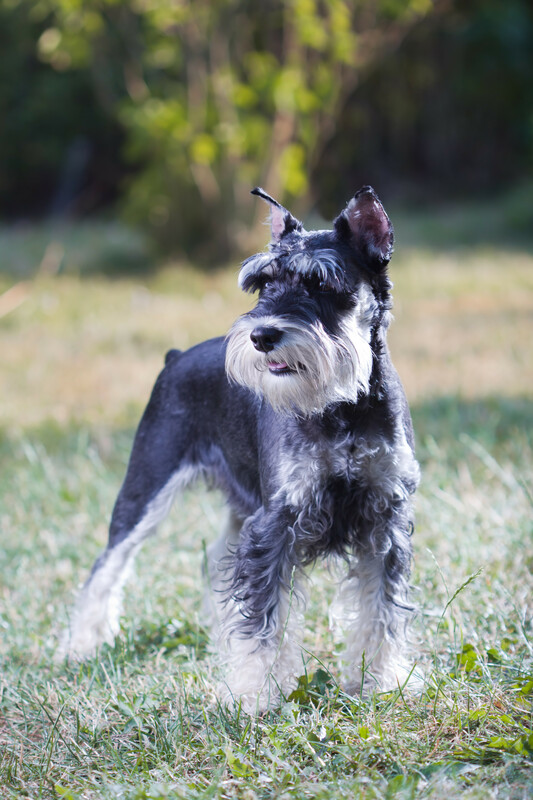 The most popular breed in the Terrier group is the Miniature Schnauzer at #17. Other dogs in the Terrier group include the West Highland White Terrier (#41), Soft Coated Wheaten Terrier (#50), Airedale Terrier (#55), and others2. You may have noted that Terriers fall lower on the popularity list and that is because a terrier is not for everyone. The AKC group description indicates that dogs in the Terrier group often have issues with other animals, including dogs. I describe Terriers as being the Seal Team of the dog world; they seek out and kill and do it very efficiently. That sometimes makes them less than ideal for those new to dogs, those with children, and those that are fans of backyard wildlife. 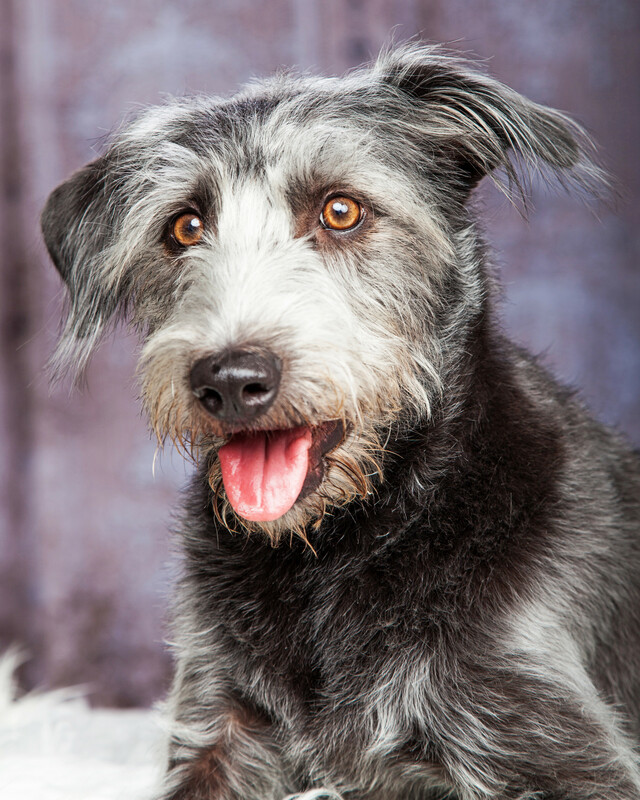 If you have other animals in your home, talk to a certified dog trainer or canine behavior consultant about adding a Terrier to your family before committing to do so. The most popular breeds in the Toy group include; Yorkshire Terrier (#9), Cavalier King Charles Spaniel (#19), Shih Tzu (#20) and Pug (#32)2. 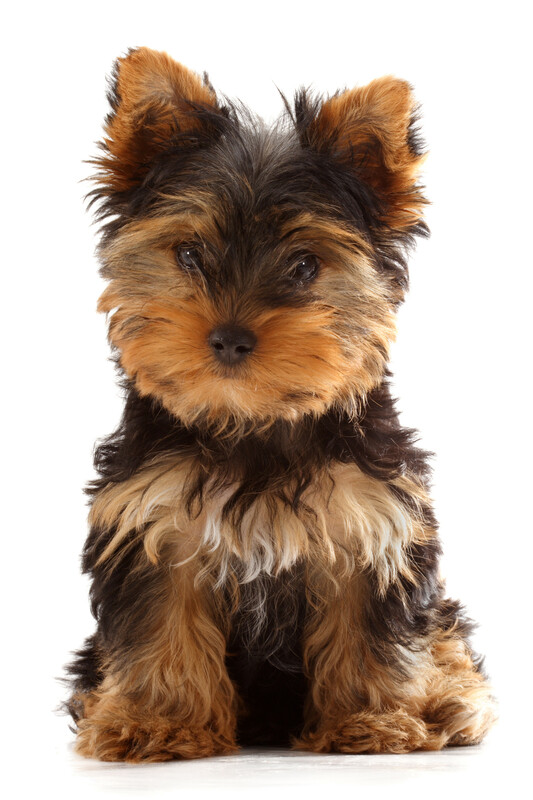 The most distinguishing feature of these breeds is their size; they are small. The shape of their faces, the length of their coat, and personality can vary widely. 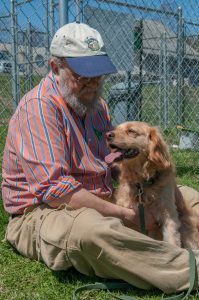 Many breeds in the Toy group were bred specifically to serve as lap companions. We see several toy breeds for boarding and grooming at Green Acres, and they have very endearing qualities. For someone that primarily wants a canine buddy, they can be ideal. I often recommend both the Cavalier King Charles Spaniel and the Pug for first-time dog parents. They are small, durable, have great personalities and are pretty low maintenance, although both breeds may suffer from serious health issues. Next month I will close out this three- part series by discussing the AKC Working group and Mixed Breed dogs. This is part three of a three-part series on the importance of understanding your dog’s breed and what they were bred to do before selecting a dog. That understanding is critical to making sure you get the perfect dog that we all seek. In July I discussed AKC Herding and Hound groups and in August I looked at the Non-Sporting, Sporting, Terrier, and Toy groups. This month I will address the AKC Working Group and Mixed Breed dogs. 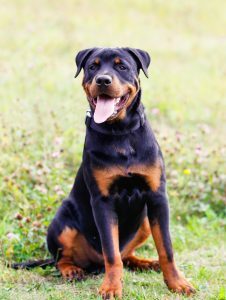 If you look at the top 10 list for dogs in the US you will find these breeds from the Working group; Rottweiler (#8) and Boxer (#10). 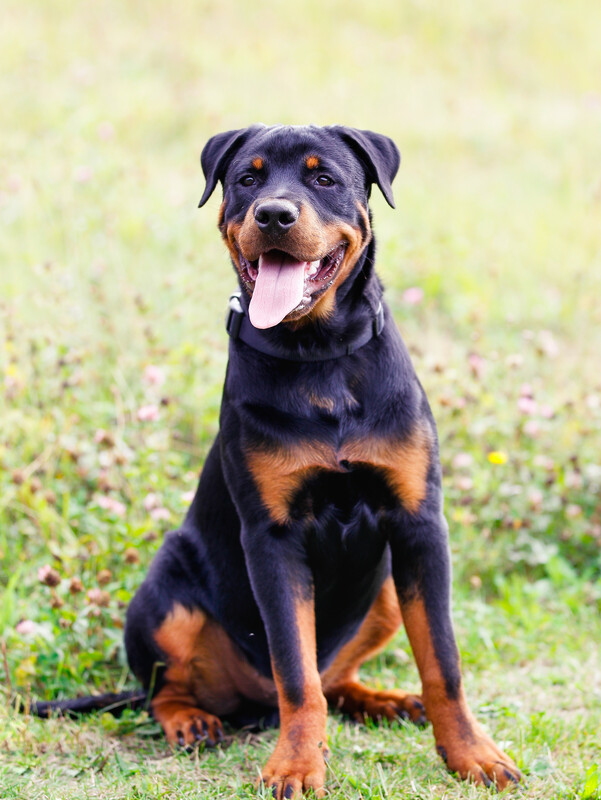 Other popular breeds in this group include the Siberian Husky (#12), Great Dane (#14), Doberman Pinscher (#15), Bernese Mountain Dog (#27),Newfoundland (#35), and others2. Like the Non-Sporting group, the breeds in the Working group are so diverse that discussing them as a group is not helpful. For that reason, I recommend that anyone considering a dog from this group talk to breeders as well as veterinarians, trainers, kennel and daycare owners about the particular breeds that interest you. Always make sure you seek advice from those with no financial gain in the breed that you choose. The dogs in the Working group were bred for a wide variety of purposes. The livestock guarding dogs were historically bred in the fields with the animals that they are supposed to protect. They are independent and naturally suspicious of all but the flock they guard and a few people. The Northern breeds in this group; Alaskan Malamute, Siberian Husky, and Samoyed love the cold and snow and find the heat uncomfortable. 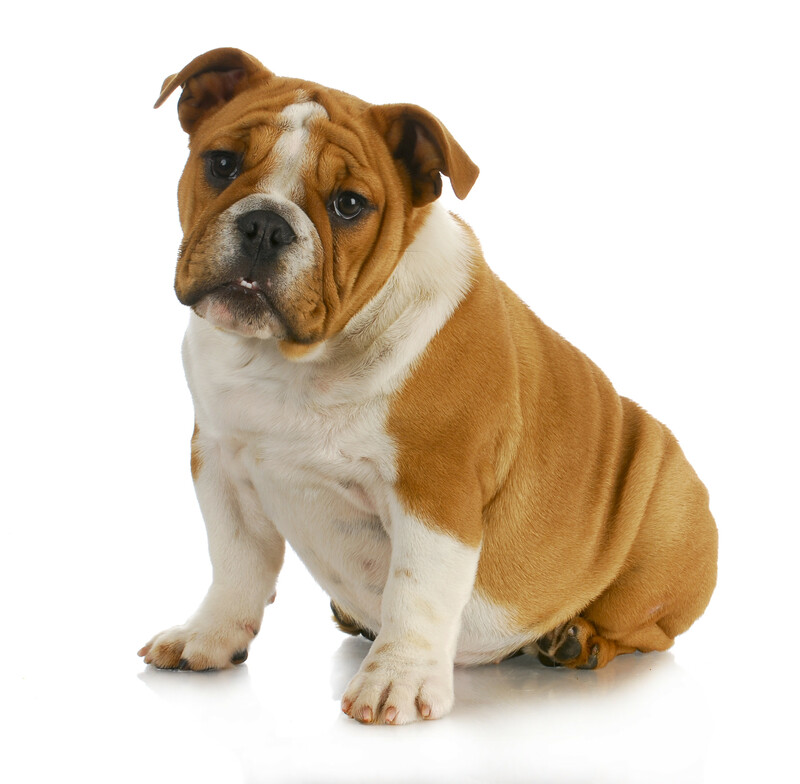 Other factors to consider with the breeds in the Working group are their size and strength. Can you safely handle a dog this big? Are you physically able to or do you have a plan to lift them and carry them should the need arise? Are you committed to training the dog? A dog from the working group can be an excellent choice if your lifestyle is compatible with what they need to thrive. If you have other dogs in your life, you need to consider the difference in size between the dogs. The play between a large dog in from the Working group and a toy breed will need to be carefully supervised. We care for many dogs in the Working Group, primarily Boxers, Great Danes, Bernese Mountain Dogs, and Mastiffs. They all do well, and we enjoy seeing them; however, they each have very individual personalities, so it is important that we take the time to get to know them well. The most important consideration when getting a dog is their temperament and personality. While both vary in any breed, when choosing a pure-bred puppy or dog you can look to the breed for a highly probable predictor of what you will get. The same cannot be said of mixed breeds. Fifty-percent of the dogs in the US are mixed breeds. I know from personal experience, with my own mixed breeds as well as the many that we care for at Green Acres, that mixed breeds can be marvelous companions. However, when getting a mixed breed, it can be problematic because you do not always know what you are getting. Knowing what breeds make up your mixed breed is difficult at best unless you make use of a reliable DNA test. Unless your mixed breed is a “designer breed” like one of the many varieties of Doodles, there was probably no witness to the breeding. That means that your mixed breed was labeled as being a “something/something” by a person, based solely on their appearance or physical traits. Unfortunately, that is not a very accurate way to determine a mix of breeds. In 2012, a study3, 4 was initiated to “…determine the accuracy of visual breed identification compared to DNA breed profiles.” The study looked at 100 shelter dogs. Photos of the dogs were reviewed by “Self-identified “dog experts,” including breeders, exhibitors, trainers, groomers, behaviorists, rescuers, shelter staff, veterinarians, and veterinary technicians…” Their identification of the breed mix of each dog in the photo was compared to a DNA test of that dog. The results indicated “Respondents correctly identified a prominent breed an average of 27% of the time. Each of the dogs had an average of 53 different predominant breeds selected. No one correctly identified a breed for 6% of the dogs, and 22% of the dogs had the correct breed chosen less than 1% of the time. Only 15% of the dogs were correctly identified more than 70% of the time. These results indicate that, regardless of profession, visual identification of the breeds of dogs with unknown heritage is poor.” [Emphasis added] In other words, mixed breed dogs in shelters or rescues are misidentified more often than not. My dog Muppy was labeled as a Golden Retriever/Cocker Spaniel mix when we adopted her. She certainly looks like a Golden Retriever/Cocker Spaniel mix, and we love her just as she is, but we decided to do a DNA test just to learn more. The Mars Wisdom Panel reports that Muppy’s DNA indicates that she is 37%, Cocker Spaniel. The test was not able to identify other specific breeds in her lineage but does suggest that the next largest component comes from the Terrier group. Muppy has DNA from what the Mars Wisdom Panel defines as the Middle East and African group which contains breeds such as the Afghan Hound, Basenji, Saluki, and Rhodesian Ridgeback. Lastly, according to the test, she contains some DNA from the Herding group. We decided to do a second test, this one by Embark, which many consider to be more definitive. The Embark test reports that Muppy is: 44.7% Cocker Spaniel, 30.0% Rat Terrier, 12.2% Boston Terrier, and 13.1% SuperMutt. The latter is a category where Embark lumps together other DNA evidence that suggests Muppy may have small amounts of DNA from other distant ancestors, in her case: the American Eskimo Dog, Bearded Collie, and Collie. No identifiable DNA was found in Muppy that would suggest that she is part Golden Retriever, Both tests indicate she is predominantly Cocker Spaniel and terrier. I suspect the Golden Retriever came into play when she was in rescue. When Muppy was rescued, she was pregnant. I have seen photos of her puppies and photos of two of those puppies as adults, and her offspring most definitely look like Golden Retrievers. It is quite possible that the father of Muppy’s pups was a Golden or a golden mix. However, the point is, judging by appearance only is highly inaccurate and Muppy is a prime example of how looks can be deceiving. No one labeled her as part terrier based on her appearance, yet both tests suggest a significant amount of terrier DNA. From a behavioral perspective, Muppy shows several traits from her Cocker Spaniel lineage; she is very into birds; she points, and she retrieves. She also knows how to use her nose, and does so more than any other dog I have owned. I do not know if that trait is because of her DNA or is a behavior that was learned in order to survive as a stray. Muppy has been very easy to train, which could be due to her Sporting Group genes or her possible Herding DNA, or both. I do not see any Terrier behavioral characteristics. Don Hanson is the co-owner of the Green Acres Kennel Shop (greenacreskennel.com) in Bangor. He is a Bach Foundation Registered Animal Practitioner (BFRAP), Certified Dog Behavior Consultant (CDBC), Associate Certified Cat Behavior Consultant (ACCBC) and a Certified Professional Dog Trainer (CPDT-KA). He produces and co- hosts a weekly radio show and podcast, The Woof Meow Show heard on The Pulse AM620 WZON and streamed at http://www.wzonradio.com/ every Saturday at 9 AM. A list of upcoming shows and podcasts of past shows can be found at www.woofmeowshow.com. Don also writes about pets at his blog: www.words-woofs-meows.com. Other factors to consider with the breeds in the Working group are their size and strength. Can you safely handle a dog this big? Are you physically able or do you have a plan to lift them and carry them should the need arise? Are you committed to training the dog? A dog from the working group can be an excellent choice if your lifestyle is compatible with what they need to thrive. If you have other dogs in your life, you need to consider the difference in size between the dogs. The play between a large dog in from the Working group and a toy breed will need to be carefully supervised. From a behavioral perspective, Muppy shows several traits from her Cocker Spaniel lineage; she is very into birds; she points, and she retrieves. She also knows how to use her nose, and does so more than any other dog I have owned. I do not know if that trait is because of her DNA or is a behavior that was learned in order to survive as a stray. Muppy has been very easy to train, which could be due to her Sporting Group genes or her Herding DNA, or both. I do not see any Terrier behavioral characteristics. Some of the more popular breeds in the Non- Sporting group include Bulldogs (#4), French Bulldogs (#6), Poodles (#15), the Bichon Frise (#45), Dalmatian (#62), Keeshond (#92), and more2. I recently saw a meme posted on Facebook with the words “Getting a dog without understanding the breed is like buying a house without an inspection.” A discussion followed as to whether or not this was a good way to emphasize that breed matters when you are selecting a dog that will best fit into your family, lifestyle, and the environment in which you and your dog will live. 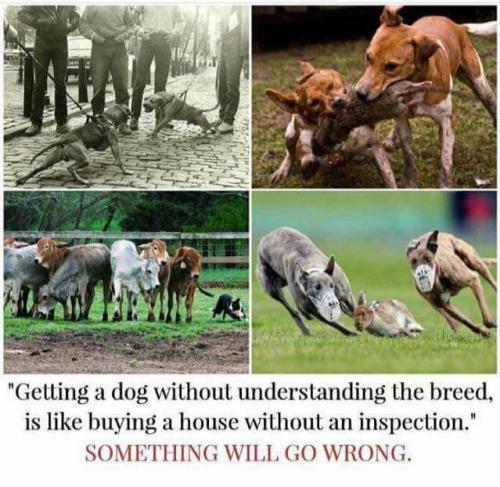 I agree with the sentiment of the text in this meme; however, I believe that the question of how important breed is when selecting a dog is far too important to leave to a discussion on Facebook. If you want the greatest probability of getting a great canine companion, you need to consider breed before purchasing or adopting a dog, and your research needs to extend beyond social media and avid fans of the breed. In some cases, the AKC group description is helpful in understanding what a dog was bred to do, while some of the groups contain breeds with a wide variety of individual physical and behavioral traits and I question how they were lumped into the same group. However, looking at the Group is a good place to start. Below you will find my thoughts on each AKC group and factors that I recommend you consider before deciding which breed is the best for you. Please recognize that you want to choose a breed that is also the best choice for your family, your lifestyle, and the environment in which you live. The lifespan of a dog, which can also be breed dependent, can range from six to eighteen years. As you consider your current lifestyle and environment, think about the future and what your life will be like when your dog is older. Adding children to your life or moving from a rural to an urban environment should be considered when you choose your breed. Next month I will discuss the Non-Sporting, Sporting, Terrier, and Toy groups. Whether it is your first dog or you have had dogs your whole life, whether you have no other pets or lots of other pets, whether you live alone or live with a large family, adding a dog to your life is a big decision and requires careful thought and planning. As a pet care professional with over 19 years of experience, I have heard countless stories of what can happen when you bring a dog home on impulse. Yes, it might turnout just fine, but there have also been many times where being impulsive leads to heartache. I suspect that there is a “right dog” for most every situation, but not all dogs will be right for your situation. So before you start thinking about which breed you want, whether you’ll get a rescue or purebred, a puppy or an adult, I suggest you ask yourself the following questions. What is the primary reason you want a dog? – Companionship is probably the most typical reason people get a dog. Other reasons might be so that you can compete in dog sports or to do therapy dog visits at nursing homes and hospitals. Perhaps you want a dog as a hunting companion or to help you on the farm. Some people will even think they want a dog to teach their children responsibility or for protection. If it’s either of these last two, I’ll try to talk you out of getting a dog for those reasons. Alternatively, you might be looking for a dog to be a service/assistance dog for yourself or a family member. In this situation your best option is to let a qualified and reputable service dog agency select and train the dog for you. Most dogs, even the ones specifically bred to be service dogs, do not have what it takes to develop into a reliable service dog. My point is that there are several reasons you might want a dog and how you answer this question will determine what breeds you should consider and those that would be out of the question, whether you want a puppy or an adult dog, and whether or not you should consider a purebred or a mutt. Where will you be 15 years from now? – Depending on the breed and individual dog, your new canine friend will hopefully be with you for 12-15 years, perhaps longer. Your life, where you live, who lives with you, the amount of free time you have, your financial resources, your health and physical abilities, and your dog’s health can and will very likely change a great deal in 15 years. When adding a dog to a family I believe you need to plan for it being a lifetime commitment. That means you need to think ahead and be sure that the reason you want a dog today will still be the reason you want a dog several years from now. When we recently added our new dog my wife and I knew we needed a smaller dog. We both have back issues, and carrying our 16 year old Golden up and down the stairs was difficult at best and we knew we would not be able to do that 15 years from now. What are your deal breakers? – Even though we make a lifetime commitment to a dog sometimes things happen and it is in the best interest of you and your dog to part ways. This can be heartbreaking for all involved. One of the best ways to prevent that heartache is to spend some time before you welcome a dog into your home deciding what would be a reason you would not want or be able to keep a dog. Some reasons that people have given for ending the relationship; the dog bites someone, you need to move into town and the dog cannot adapt, the dog kills another animal, someone in the family develops allergies, the dog urinates and defecates inside and cannot be trained, the dog has separation anxiety and you work 14 hours a day, the dog barks excessively and the neighbors are complaining, you move in with a new life partner and your dog hates their dog, etc.. The point is that unexpected things happen, sometimes beyond our control. If you can identify these deal breakers before you choose a dog, you may be able to select a pet that decreases the probability of these unfortunate situations developing. What happens next? – After you have answered these questions for yourself, I recommend you share them with at least a few pet care professionals; a veterinarian, a dog trainer or behavior consultant, a daycare/kennel operator or a dog groomer. You want someone who can give you an objective opinion based on extensive experience with many breeds as well as individual dogs. 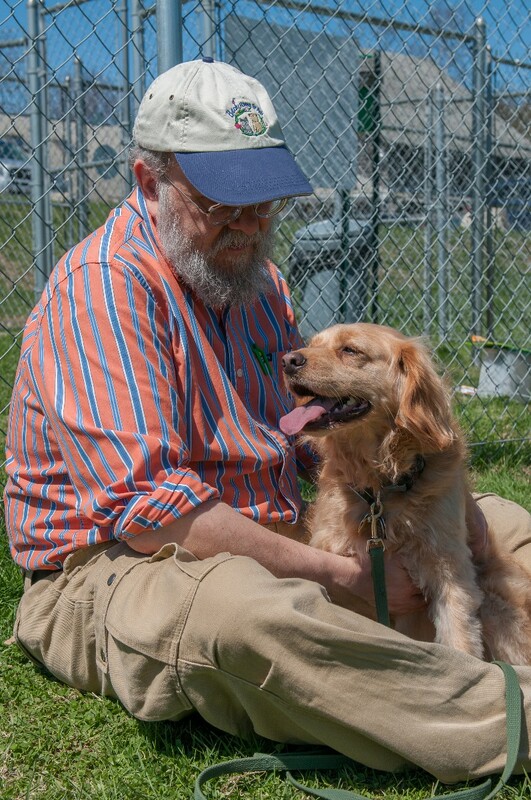 Breeders, rescues, and shelters can provide useful input; however, remember that they are hoping you will choose one of the dogs that they have available. This is not to say that we do not all have our share of biases; for this reason talking to several people will give you a broader perspective. At Green Acres Kennel Shop, we will gladly sit down and have this discussion with you at no charge, because we know it’s going to result in a good match.